Back when electric guitars were a new thing, winding pickups was a very labor intensive and error-prone process. The number of windings could easily vary by a few hundred turns of wire, making the resulting pickup either anemic or much more powerful than the other pickups in the guitar. 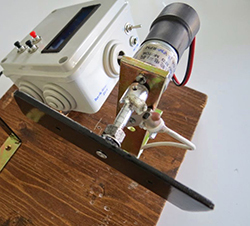 [Davide] is starting to wind his own pickups, and desiring a little more precision than simply guessing how many winds are on a coil he built an AVR coil winding machine. The machine uses a DC gear motor running at 1200 RPM. A magnet is glued onto the motor shaft, and a hall effect sensor connected to an ATMega8 keeps track of how many windings are on the coil. The interface is simple, using character LCD to display a wind counter, motor direction, and current motor speed. There are some useful features in this machine; slow start-up and automatic stop makes winding pickups much easier than the traditional home method of winding pickups with a sewing machine. With tiny Linux boards popping up like dandelions, it was only a matter of time before someone came out with a really tiny Linux board. This is it. It’s a tiny board less than an inch on each side with an 802.11n System on Chip running OpenWrt on Linux. The best part? You can pick one up for $20 USD. 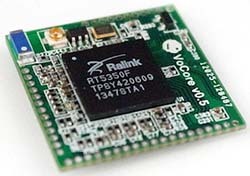 The VoCore isn’t so much as a cut down ARM dev board as it is a cut down router capable of running OpenWrt. It’s not a power house by any means with 8MB of Flash, 32MB of SDRAM, and a 360MHz CPU, but if you ever need something that’s less than an inch square, you probably don’t need that much power. The VoCore features interfaces for 100M Ethernet, USB host and device, UART, SPI, I2C, I2S, and 20 GPIOs for blinking LEDs and listening to sensors. There’s also a dock that breaks out the Ethernet and USB ports, available as a kit or already assembled. It’s a pretty cool device, and with low current draw (about 200mA) and being able to accept +5V power, we can easily see this tiny board popping up in a few projects. Here’s a clever use of a webcam and some facial recognition software — They call it Happy ++ and it will DJ [Pharrell’s] Happy according to how much you’re smiling (or not at all!). It’s another project to come out of MIT’s Media Lab for a spring event this year by [Rob, Dan & Javier]. The facial tracking software was re-used from an older project, the MIT Mood Meter, which was a clever installation that had several zones on campus tracking the apparent “happiness” of the students walking by. Many have tried, but [Christoph Laimer] has succeeded in designing a working, (relatively) accurate clock nearly completely from 3D printed parts. Every gear, pulley, wheel and hand of [Christoph’s] clock is printed. Only a few screws, axles, a weight, and a string are non-printed. Even the crank to wind the clock is a 3D printed part. [Christoph] designed his clock in Blender. It took quite a bit of design work to create parts that would work and be printable. Even more work was involved in printing over 100 failed prototype parts. One might think that [Christoph] is using the latest printers from the likes of Makerbot or Utimaker to achieve this feat. It turns out he’s using a discontinued Rapman 3.2 printer. Further proof that even “older” printers are capable of great things! [Christoph] does run his printer rather slowly. Printing a single gear with 0.125 mm layers and a 0.4 mm nozzle takes him 2 or 3 hours. Mechanically, the clock is gravity powered with an anchor escapement. Rather than a pendulum, [Christoph] chose to use a balance wheel and hairspring assembly to govern the escapement. Even the spring is printed from standard PLA. The weight is suspended from a pulley block. The clock isn’t particularly efficient. 70cm of height will run the clock for only 2 hours. [Christoph’s] clock has proven to be accurate to within 1/4 second per hour. He hasn’t provided temperature stability data – but being PLA, we’d suggest not getting it too hot! If you’ve written a great library to generate random numbers with a microcontroller, what’s the first thing you would do? Build an electronic pair of dice, of course. [Walter] created the entropy library for AVRs for a reliable source of true random numbers. It works by using the watchdog timer’s natural jitter; not fast by any means but most sources of entropy aren’t that fast anyway. By sampling a whole lot of AVR chips and doing a few statistical tests, it turns out this library is actually a pretty good source of randomness, at least as good as a pair of dice. The circuit itself uses two 8×8 LED matrices from Adafruit, an Arduino, and a pair of buttons. The supported modes are 2d6, 2d4, 2d8, 2d10, 1d12, 1d20, a deck of cards, a single hex number, a single 8-bit binary number, or an eight character alphanumeric password. It’s more than enough for D&D or when you really need an unguessable password. Video demo below. Imagine this. A phone on a nearby desk starts ringing. No one is around to pick it up, so you decide that you will be a good Samaritan and answer the phone. You are greeted by a slightly creepy robotic female voice asking you to complete a simple survey. Having nothing else to do, you go ahead and run through the telephone survey. As you start answering the questions, things start to get a bit… weird. The robot voice doesn’t like your answers. She actually disagrees with you, and she does NOT like being interrupted. Now she’s getting sassy with you! What is going on here? Most likely you are the latest victim of Insert Customer Feedback Here, [Charles’] art installation. You see, that is no ordinary telephone. [Charles] actually removed the guts of an old telephone and replaced them with an Arduino. The Arduino periodically rings the phone, waiting for someone to answer. Once the phone is off the hook, the Arduino uses a Wave shield to start playing back the scripted audio files. All of the text-to-speech files and the various hold music files are played back with the wave shield. The Arduino is also hooked up to the 1, 2, 3, and # keys of the telephone keypad in order to read back the user’s responses. From here on out the program acts as a sort of “choose your own adventure” game. The program takes different paths and responds in different ways depending on how the user answers the questions. Generally speaking, it will get more “irritated” towards the user if it doesn’t “like” your answers, otherwise it will get less irritated. The hold music will even change to become more or less aggressive. In the past month, a few patent applications from MakerBot were published, and like everything tangentially related to the prodigal son of the 3D printer world, the Internet arose in a clamor that would be comparable only to news that grumpy cat has died. That’s just an analogy, by the way. Grumpy cat is fine. The first patent, titled, Three-dimensional printer with force detection was filed on October 29th, 2013. It describes a 3D printer with a sensor coupled to the hot end able to sense a contact force between the nozzle and build plate. It’s a rather clever idea that will allow any 3D printer to perform software calibration of the build plate, ensuring everything is printed on a nice, level surface. Interestingly, [Steve Graber] posted an extremely similar design of a bed leveling probe on October 6th, 2013. In [Steve]’s video, you can see his bed level probe doing just about everything the MakerBot patent claims, all while being uploaded to YouTube before the patent application. When it rains it pours, and the Quick-release extruder patent application, filed on October 28, 2013, bears this out. It claims an extruder that includes, “a bistable lever including a mechanical linkage to the bearing, the bearing engaged with the drive gear when the bistable lever is in a first position and the bearing disengaged from the drive gear when the bistable lever is in a second position.” Simple enough, a lever with two positions, where one presses a bearing against a drive gear, and the other position disengages the bearing from a drive gear. Here’s something that was published on Thingiverse in 2011 that does the same thing. Hugely famous RepRap contributor [whosawhatsis] has weighed in on this as well. It is important to note that these are patent applications. Nothing has been patented yet. The US Patent and Trademark Office does seem to have a lot of rubber stamps these days, so what is the average Internet denizen to do? Here are easy to follow, step-by-step instructions on how to notify the USPTO of prior art. Remember, just because prior art does not completely invalidate a patent application’s claims doesn’t mean you shouldn’t send it in. It is a patent examiner’s job to review the prior art. So there you go. MakerBot applies for patents, people complain, but not to the USPTO. Highly relevant video and transcription below.